The South Bay Reapers were formed by a local baseball fanatic named Juan Montalvo to begin play in the 2010 baseball season. The team is mostly comprised of players that were not only born and raised in the city of Sunnyvale, but they also played baseball together in little league, high school, and beyond. The team name represents the farmers and laborers that reaped wheat in the area that is now called Sunnyvale and Silicon Valley. When most people think of Silicon Valley and the history behind the land, orchards usually come to mind. Well, that is true. But what most people don’t realize is that before the many varieties of orchards colored the valley and hillsides, the land was used for growing wheat. Even though the team name is derived particularly from the time period before the orchards covered the land, the reapers team colors are a representation of what came after. The Reapers will sport a vintage, two-tone “players league” baggy-style uniform that is an embodiment of Sunnyvale’s most popular fruit… the cherry. The inaugural season of 2010 was a huge success for the South Bay Reapers as they familiarized themselves with the Vintage Base Ball rules and style of play. It was a rough start at first but once they got some games under their belts, they were soon competing with the league's finest. In July 2011, they were featured in the 75th anniversary celebration of Washington Park along with the Santa Clara Stogies. During this event, they played for the Mayor of Santa Clara on only the true vintage field in the South Bay and were instrumental in achieving the "turning back the clock" type of atmosphere. Currently the team is gearing up for the 2013 season and is back in the cages getting some swings in. The Vintage Base Ball "Spring Training" has officially started and "Opening Day" will be March 17th. 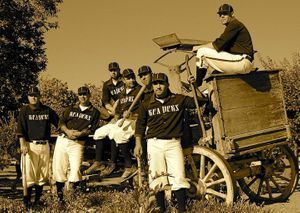 The upcoming 2013 season will be a true test for the South Bay Reapers as the California Vintage Base Ball Federation brings on a fiifth team. But one thing is for sure... if the South Bay Reapers can pick up where they left off, they might be looking at their very first Cal Cup berth in the summer of 2013.